Jordan DiBiasi and Stanford will open their bid for back-to-back national titles against Seattle. No season goes smoothly, but 2018 has been a grind for the ages in NCAA women's soccer. 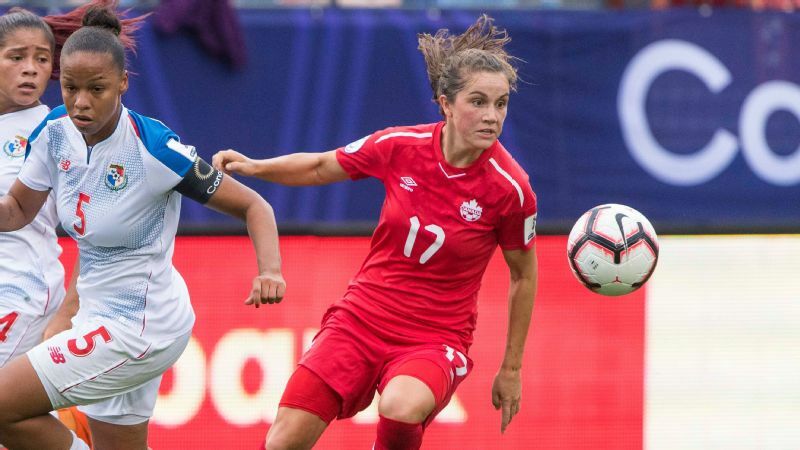 Dozens of rising stars missed the start of the season because of the FIFA Under-20 Women's World Cup. Even more proven standouts later excused themselves to aid in qualifying efforts for next year's senior World Cup. Injuries, albeit an annual plague, took their toll throughout. But for those left standing, the finish line is in sight. With the NCAA tournament bracket in hand, 64 teams are four games and a little less than three weeks away from earning a place in the College Cup in Cary, North Carolina. History suggests that the roads leading to Cary will run through the No. 1 seeds. In the past 10 tournaments, No. 1 seeds claimed 27 of 40 possible berths in the semifinals. And it is getting more difficult for Cinderella. Since the tournament format changed in 2011 -- allowing 32 teams to host in the first round but making it less likely that any but No. 1 and No. 2 seeds host thereafter -- the chalk is even stronger. In seven tournaments with that format, only Duke in 2015 reached the College Cup as a No. 3 seed or lower (and that only via a penalty shootout). What could get in the way of No. 1 seeds Florida State, Georgetown, North Carolina and Stanford, the defending champion and this season's top overall seed? Let's take a look. 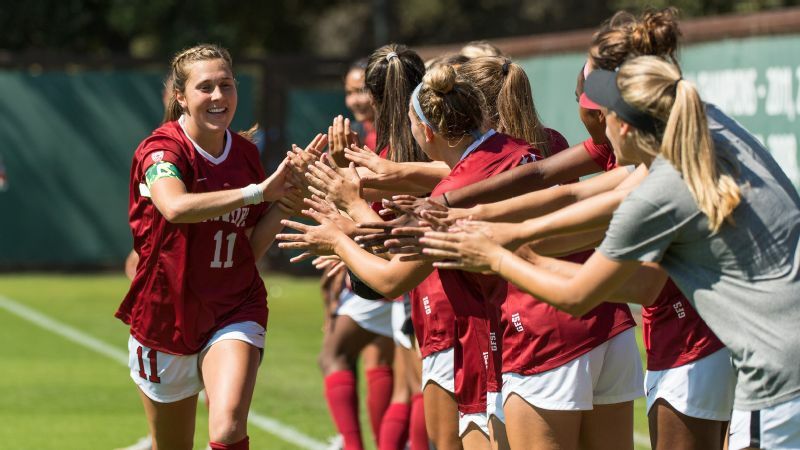 The opportunity to rank among the handful of greatest teams in the history of women's college soccer has slipped away from Stanford this season. But even in diminished form, the Cardinal have a chance to complete an unbeaten season and become the first school other than North Carolina to win back-to-back national championships. That should tell you a lot about the talent on hand. The issue for the Cardinal is health. We don't know what the team will look like when it takes the field against Seattle in the first round. 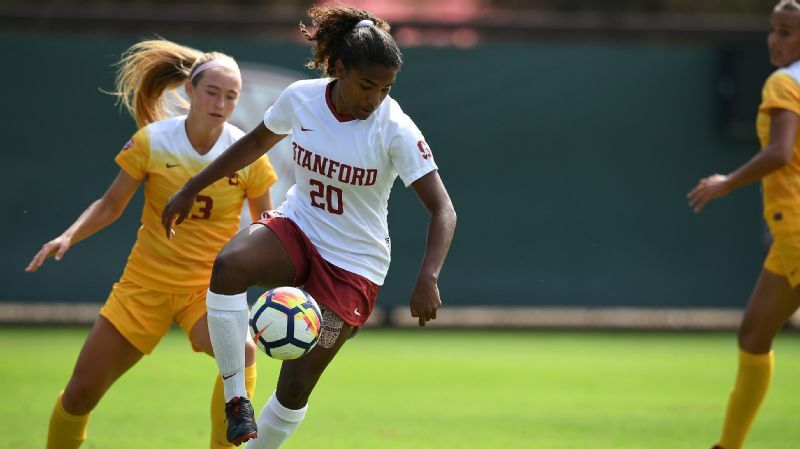 Stanford already lost All-American and U.S. international Tierna Davidson and sensational freshman Sophia Smith to injuries earlier in the season, and the Cardinal played their final two Pac-12 games without Madison Haley, Catarina Macario and Tegan McGrady for undisclosed reasons. On Monday, the Cardinal declined comment as to their status or availability. Perhaps it was just an opportunity to secure additional rest for three players (all made the Bay area trip to Cal this past weekend). But keeping players healthy has been half the story of the season for Stanford, with Alana Cook, Jordan DiBiasi and Beattie Goad the only players to appear in all 19 games. The other half of the story has been the resilience -- manifested in possession and defensive discipline -- necessary to avoid a loss. No. 2 Tennessee, No. 3 Texas A&M and No. 4 Boston College, the other seeds in Stanford's quarter of the bracket, averaged at least two goals per game against quality schedules. But Stanford was the only team that controlled its fate when the season began, and it still does. ACC tournament champion Florida State won't turn down a No. 1 seed and the chance for Deyna Castellanos & Co. to stay in Tallahassee as long as possible. The Seminoles went back-to-back seasons off the top two seeds lines, a drought by their own lofty standards. But that No. 1 seed isn't all that shiny because of one of the selection committee's strangest decisions in years: giving USC a No. 4 seed. 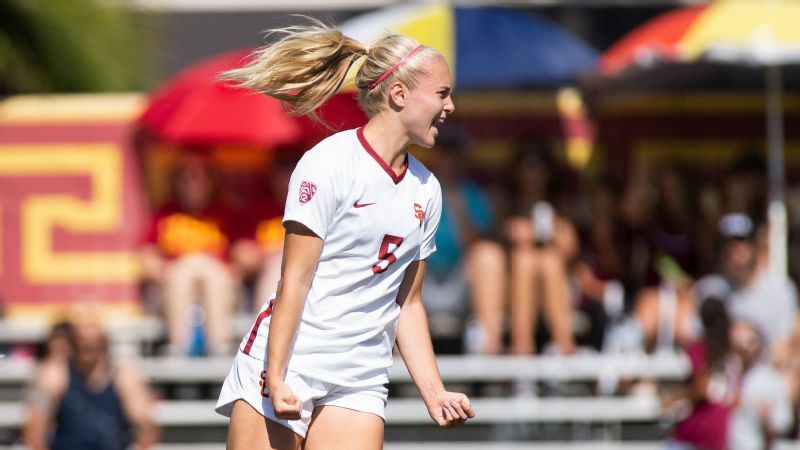 The Trojans, who were placed in the Seminoles' quarter of the bracket, entered the final week of the regular season ranked second in the United Soccer Coaches Top 25 (admittedly not among the committee's criteria but a fair reflection of what the rest of the college soccer world thought of the Trojans) and fifth in RPI. Granted, USC then lost its finale to finish 15-2-2, but it lost an overtime thriller against a UCLA rocket ship (more on that later). Maybe that loss, and a tie at Utah the previous week, knocked USC off the top seed line. Heck, maybe there is even data to justify a No. 3 seed. It's a stretch, but maybe. The committee made USC a No. 4 seed, therein suggesting that at least 12 teams had better résumés. That's staggering. USC ranked seventh nationally in scoring offense and eighth in defense. It is loaded with All-American talent in Savannah DeMelo, Penelope Hocking, Ally Prisock and more. It had bad luck with its schedule, visiting Florida in that program's worst season in years, but it played at Florida State (a tie) in addition to the rigors of the Pac-12. The result is that both Florida State and USC, if they advance, will face a much more difficult Sweet 16 game than either deserves. In Florida State's case, at least it would be in Tallahassee. A possible winner from that mess? Either No. 2 West Virginia or No. 3 South Carolina could end up hosting a quarterfinal against USC or playing a worn out Florida State. 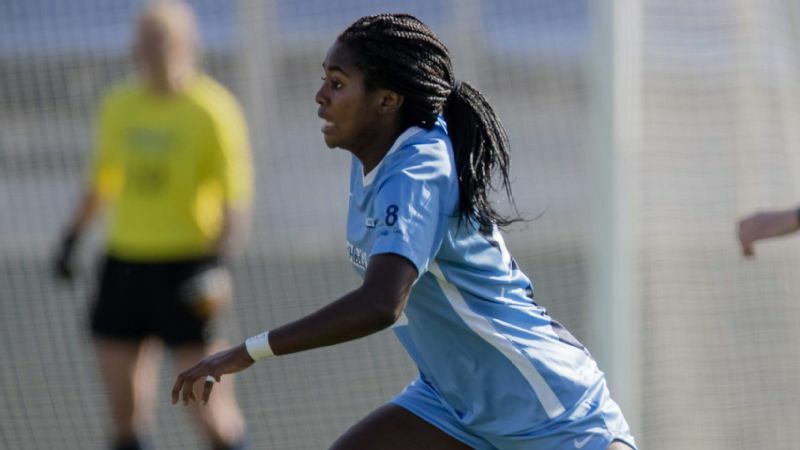 Brianna Pinto and North Carolina are on a collision course with UCLA. North Carolina drew the short straw among No. 1 seeds, with UCLA at the far end of the bracket as the No. 2 seed and the least welcome Thanksgiving guest in America. That the Tar Heels would be home over the holiday weekend is some consolation. But only some. The Bruins took the same path to their lone national title in 2013, winning a quarterfinal in Chapel Hill before winning the trophy in Cary. (North Carolina's new stadium is still under construction this season, so the Tar Heels will presumably host all their games in Cary, their home away from home). UCLA was the No. 2 seed no team wanted to draw because it played much of the season without Jessie Fleming and Hailie Mace, whose place among the best players in college soccer was confirmed by their international call-ups with Canada and the U.S., respectively, in World Cup qualifying. With those two restored, the Bruins piled up goals down the stretch. 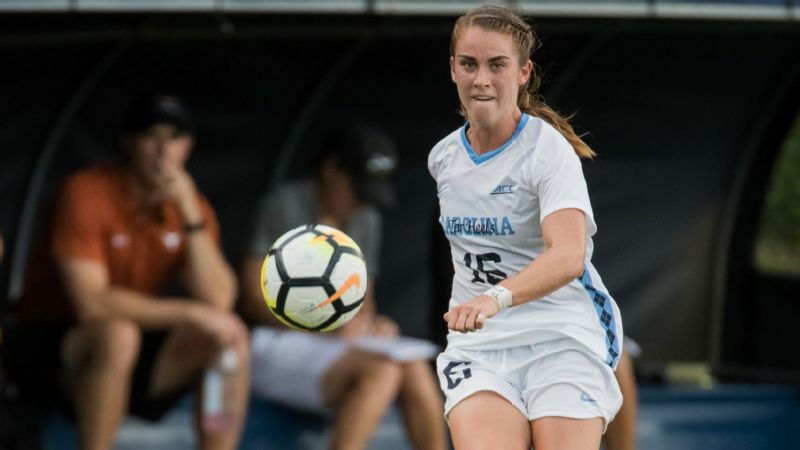 The three goals North Carolina allowed in a loss to Florida State in the ACC tournament final exceeded the goals it had allowed since the beginning of October. For now, that looks more like an aberration against an opponent used to North Carolina's pressure more than a concern -- all the more if the Tar Heels get past Howard in the first round, at which time they will add Emily Fox to the defense after her time with the U.S. women's national team. What Georgetown has done in recent years is nothing short of remarkable, not only withstanding the demise of the old Big East but also emerging as one of the nation's elite programs. The only team other than Stanford that enters the tournament unbeaten, the Hoyas are more of a national power now than they ever were in a bigger and better-regarded Big East. That isn't easy to pull off, but they have done more than settle for being the biggest fish in a smaller pond. They also have arguably the most balanced quarter of the bracket. That could include a second-round game against unseeded Washington State, which beat UCLA, tied Stanford and scored two goals against USC. But it definitely includes No. 4 Duke, which lost once in the ACC regular season, and No. 2 Baylor and No. 3 Virginia in the other half of the quadrant. For the Hoyas, with one of the nation's stingiest defenses and leading goal scorers in Caitlin Farrell, it's a chance to prove themselves against perennial ACC powers and a Big 12 team trying to prove that conference deserves the seeding support it received this season.